5 Recipes for a Cosy Date Night at Home. You have to admit. 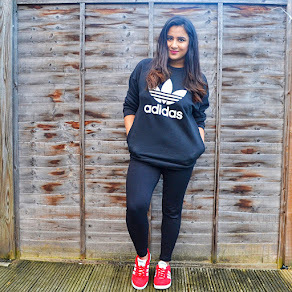 Although there is thrill, excitement, and fun in dressing up and going on a date somewhere out, NOTHING beats a cosy date night at home, whether it is on the sofa with the fire on or on the table. I love cooking soulful food. Something that hits home and just makes your insides warm! But for date nights, I need something that is sophisticated yet easy to cook! And here are some amazing recipe ideas that will make an instant hit with your partner! Or you both can cook in the kitchen together, make a proper date night out of it and marvel at your creations while you jump right in! No date night is complete with a good chicken recipe! You can even serve this with a bowl of pasta or serve it with some chips and salad! Find the recipe here. This is easily one of those dishes where you both can sit on the sofa, turn on netflix and enjoy the food with crappy reality tv or a good movie for a change. Find the recipe here. Now, obviously, no date night is complete without dessert and what is a dessert that doesn't give Godiva a run for their money? Healthy and yummy, cheesecake stuffed strawberries have to be my favourite. They are quick and easy to make and are literally devoured in on single sitting! Find the recipe here. 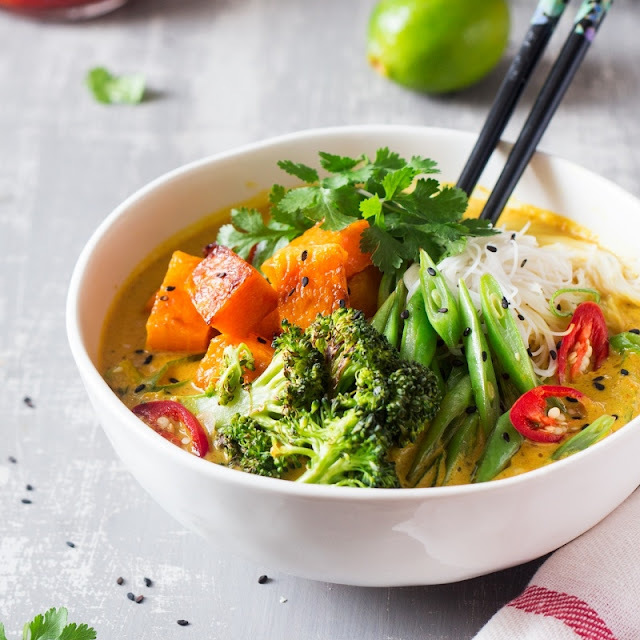 If you aren't big on having chicken, then you can definitely try out the vegan khao-soi soup! Its healthy and a bowl full of yummy goodness! There is nothing like snuggling on a cold winters night and slurping up a bowl of this soup! Find the recipe here. 5. Brown Butter Scallops with Parmesan Risotto. Now, this recipe has been featured on BuzzFeed so imagine how yummy it must be! This dish definitely gives a fancy restaurant vibe that you can devour at home haha! This recipe has a touch of white wine in this but since I know, most of my readers are non-alcoholic, you can most definitely skip out the white wine! You can find the recipe here. There is an absolute joy in food that is cooked together with love and a little bit of squabble over how much salt and chili to add. I am honestly one of those people who would rather stay at home in comfy sweats and have a scrumptious dinner when the kid is asleep and just watch good television with my other half. If you are in the UK and you're having a hard time finding a date, why don't you check out these websites? If you are over 50, you might also find a match that is local to you as well: Best Dating Sites, Date divorced singles, Dating agency Norfolk, Yorkshire dating site, Belfast Dating site. You might find that perfect adventurous someone who would love to share these dates with you! Okay, those strawberries look dangerously delicious! Meanwhile, I think I might give that Chicken Parmigiana a go. Unfortunately, I think it will only be me and my dog who'll enjoy it during a cosy night at home.... no hot dates in the planner! It’s sometimes a dilemma to decide what to cook for the evening meals. I always want to cook fresh food for my family so I cook daily and that’s why get out of options at times. These are some great ideas, I especially love the idea of chicken parmigiana. Date night is something that rarely happens in our home (4 kids one of them is always around) But we are big soup eaters, especially during the fall and winter months so I am looking forward to trying to make Khao-soi soup. Fingers cross it taste as good as the picture looks. The soup sounds TEMPTING on a cloudy day like today. I am a vegetarian but my husband would love all your suggestions here. the Brown Butter Scallops looks so yummy and mouth watering.All the dishes definitely going make your date night perfect. These all sound amazing!!!!! The Chicken Parm looks fabulous! That chicken paprika stroganoff looks delicious! My family really only eats chicken so this we will have to try! I am the opposite...would rather go out. Hate cooking, and we have different tastes in TV...so for us going out is better. I am loving the sound of Cheesecake stuffed strawberries though...might have to give them a go. Oh I love the chicken paprika stroganoff! And for desert, The cheesecake stuffed strawberries! Great recipes all around, but those two are more appealing. These are all great recipes. I want to try the Cheesecake stuffed strawberries first. I will have to get the ingredients i need to make some for dessert this weekend. I would stay home on date night for those scallops. Scallops are my favorite food. The Chicken Parmigana looks so good! I wasn't expecting the cheesecake stuffed strawberries & they look SINFUL! The combo of those two might be the perfect date night meal. I will try the stuff strawberries and the Brown Butter Scallops with Parmesan Risott Yum! Yum yum yum! I have to try those stuffed strawberries. They look devine. Love these recipes! Extra love for the strawberry one. We too like to cook together, so enjoyable and fun. Wow! These are great recipes! 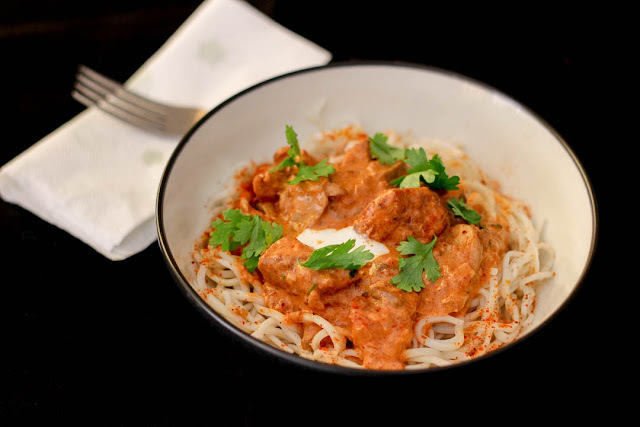 I'm excited to try the Chicken Paprika Stroganoff and Khao-Soi Soup! All the recipes are so perfect to enjoy a cosy dinner at home but that chicken and strawberries are awesome. As much as I love going out on a date I do love a good night at home with the husband as well. The strawberries look amazing and I wish my strawberry plants will hurry up and start producing! 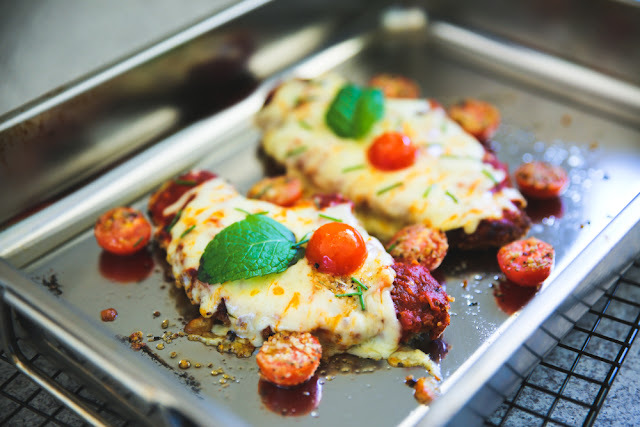 the Chicken Parmigiana looks delicious and so gooey. Lovely selection of recipes, I'd even have these on my own since I am single, ha. I love the look of the first chicken recipe, lovely with a fresh salad! These are so me great recipes to try for a date night in. 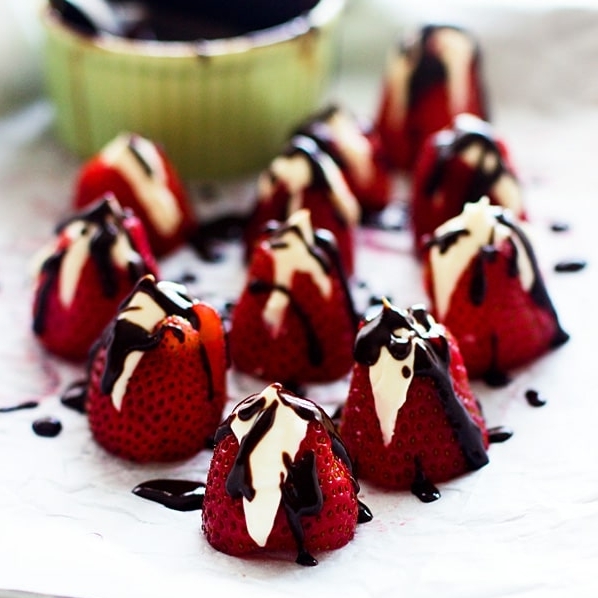 The cheesecake stuffed strawberries look delicious! I wouldn't trying the scallops too! I`m a terrible cook but reading your well written well explained post is enough to make even little me think I can cook.Thanks for sharing. Yummy, I love all the recipes here, for date night or otherwise! Definitely a huge scallops and risotto fan, so that's my favourite! These all look SO GOOD! I may have to make some of these not even for date night, just for "I wanna eat a yummy dinner tonight" night! That chicken parmigiana and cheesecake stuffed strawberries looks perfect for cozy date night. Yummy!! I need those cheesecake stuffed strawberries in my life. They look so delicious. I love to cook, but don't do it for date night very often. 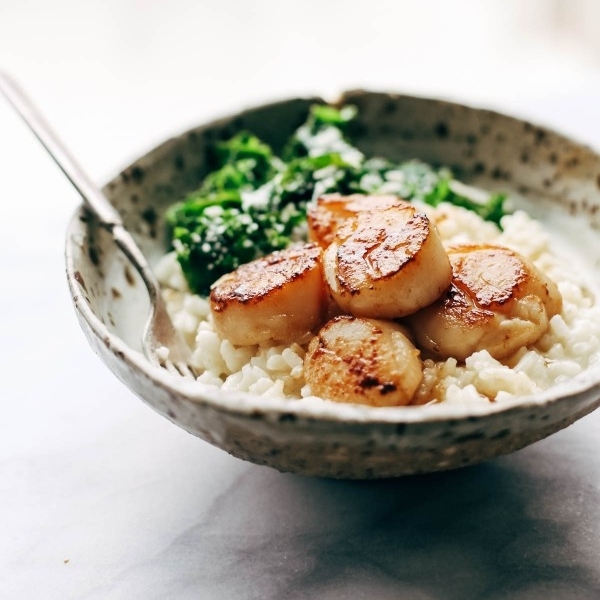 I know my husband would love the Brown Butter Scallops with Parmesan Risotto. So good! Even better if we cook them together! I wish I had a man who'd do that. But NOMS these looks so yummy! Date nights at home are the best! Don't have to leave the house and it's inexpensive. Yum! These look delicious! I like cooking when I'm feeling creative and sometimes I need some inspiration. I love making seasonal foods. We haven't had a date night in forever! For me a 'date' is when I don't have to get all dirty in the kitchen :P However, your recipes/pictures look delicious enough for me to give it a shot! I'm very excited to try the stroganoff...never tried it with chicken...usually beef. Thanks! Totally agree- if you're doing date night at home it has to be something that is sophisticated yet easy to cook! Love all the suggestions, especially the strawberries stuffed with cheesecake! Sounds amazing! I'm drooling over the cheesecake stuffed strawberries. Now I want to try them myself. Maybe I'll leave it for weekend treat. I suddenly feel hungry! Those recipes are so tempting. I'll keep your recipes and cook them all for this week! What will be a perfect wine pairing for these foods? Wow! !These dish looks so delicious and really tempting. and I think this is pretty good idea to have an cozy date night at home. I will surprise my hubby this weekend. I've never been a fan of beef stroganoff but your chicken stroganoff looks delicious. I'll be adding that to one of our meals. All of these look so good! Date nights at home are always some of the best. That version of stroganoff looks like something I would love! I am a huge fan of using chicken in recipes.